Metro Manila will be stormy. 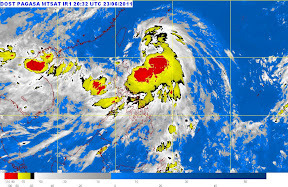 According to PAG-ASA weather forecast at 4:00PM today, tropical storm “Juaning” was estimated based on radar, satellite and surface data at 50 km Northeast of Daet, Camarines Norte (14.4°N 123.4°E) with maximum sustained winds of 75 kph near the center and gustiness of up to 90 kph. It is forecast to move West Northwest at 15 kph. This weather forecast is valid from 5:00PM today until 5:00PM tomorrow.